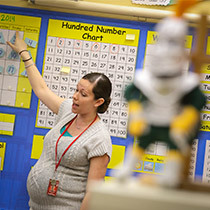 Emily Wavro ’14 works with a St. Anthony’s student. Photo courtesy John Paul Greco. Teresa (Amman) Reilly ’09 wanted to turn an ugly stereotype on its head. Specifically, the one that says kids in urban schools are unmotivated, unruly and disrespectful to their teachers. The elementary education major felt she received a wonderful education. But in her current position as instructional dean for third through fifth grades at St. Anthony’s School in Milwaukee, she felt one thing would have made it even better: experience working in a positive urban school environment. Just like the one at St. Anthony’s. Reilly mentioned this to Tom Kunkel, president of St. Norbert College, at an alumni gathering. Kunkel then talked to Bob Osgood (Education), who spoke to Reilly and, eventually, Sandy Murphy (Campus Ministry). Soon a new partnership – and program – was born. 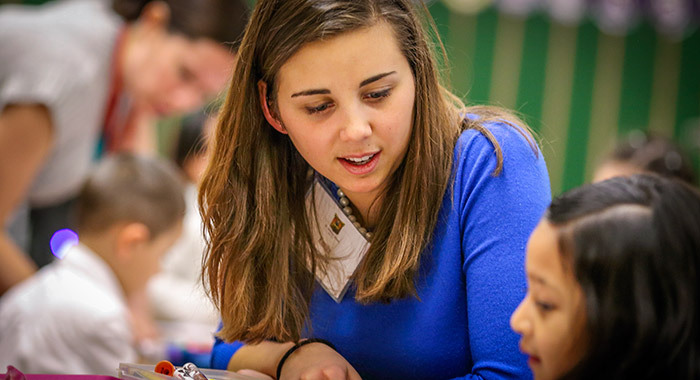 Through the college’s TRIPS service break program, education students can now sign on to work with St. Anthony’s teachers during their winter or spring break. The kicker? The school employs an astounding 12 SNC alumni. “That’s a very cool, rare thing,” says Murphy. The new TRIPS program had a short trial run in the spring of 2013, then its first full session in January 2014. All participating St. Norbert students were paired with St. Norbert alumni teachers at the school and allowed to participate however they felt most comfortable – whether merely absorbing the urban educational environment or plunging right in and teaching classes. The result? A big thumbs-up from everyone involved. Katherine Spude ’14 admitted that before her trip, she assumed urban schools were filled with low-achieving, ill-behaved kids. No more.“The students at St. Anthony’s are more driven and determined to go to college and be successful than those at any other school I’ve worked with,” she says. One St. Anthony’s alum is already enrolled at St. Norbert. Thanks partly to hearing positive comments about the college from the 12 SNC alums teaching at his school, Jose Castillo ’16 began his freshman year at St. Norbert this past fall. St. Anthony’s was founded in Milwaukee in 1872 as a German parish. Its school opened with 150 students. Like many Catholic schools in America, St. Anthony’s saw its enrollment surge for several decades before dwindling in the 1960s. But thanks to the work of many, its student body stabilized and then grew exponentially. Today St. Anthony’s is the largest K-12 Catholic school in the nation. Its 1,600-plus student body is 99 percent Hispanic, and students study at five campuses. Numbered among the staff are Sarah (Gunnlaugson) Shows ’05 (above), Kelly Meier ’06, Claire (Rebarchik) Brefka ’96, Kristin Ziarnik ’05, Sarah (Rozmarenoski) St.Martin ’06, Ashley Schultz ’13, Teresa (Amman) Reilly ’09, Michelle Deutsch ’09, Amy (Schilz) Maki ’11, Jim Schultz ’01, Elyse Krautkramer-Kuhn ’07 and Megan Derse ’12.